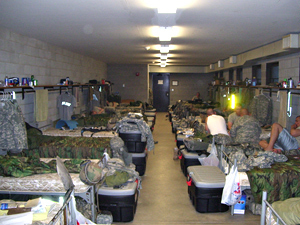 Iowa soldiers at Camp Ripley barracks. Iowa National Guard soldiers are training at Camp Ripley in Minnesota for deployment to Afghanistan in what will be the largest deployment by the guard since World War Two. Radio Iowa’s Dar Danielson spent some time at Camp Ripley and talked with the soldiers about their training and feelings about the upcoming mission. Not only are the 28-hundred soldiers who’ll be on the ground in Afghanistan involved in this training, but support units of the guard are also in Minnesota for a full-scale summer exercise involving a total of 4,000 Iowa National Guard soldiers. The deployment includes a mix of experienced soldiers and newcomers. Captain Mike Wedemeyer of Adel is the executive officer for the headquarters command that will go to Afghanistan. Wedemeyer was previously deployed to Iraq, and says the training this time is much different — including the amount of time being devoted to the preparation. He says he had 22 hours to prepare to report to Iraq, while he found out in February he’d be deployed to Iraq. Wedemeyer says this training should have soldiers more prepare. Wedemeyer says the training this time is a lot more specialized with specific “Army Warrior” tasks and battle drills that soldiers need to know before being deployed. He says in 2003 when things kicked off for the Iraq deployment, it was a “mass rush to get troops overseas.” The different units are in various stages of training at Camp Ripley, but Wedemeyer says the main goal is the same. 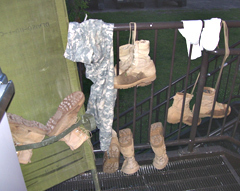 Boots of ING soldiers drying after wet day of training. “A lot of the things we have been talking about is just paying attention to their training and understanding it’s not a weekend drill anymore, …these are real scenarios that we are going through, because it’s going to be real life missions when we get over there,” Wedemeyer says,”everything from as simple as basic common courtesy and discipline to actually making sure that every soldier understands his or her job to the most that we are able to provide for them.” Not many of the soldiers have been deployed to Afghanistan before. Sergeant Glen Bulger, a Tipton native, is now with a Davenport engieering company and has been to Afghanistan. He is is sharing his experience with others. Bulger says he was up in the northeast portion of Afghanistan and says the country is actually quite beautiful if you like mountains. Bulger says the soldiers in training are seeing photos of “camel spiders the size of sleeping bags” and he says he others who have been to Afghanistan before can help dispel some rumors and offer advice “to the Joe’s” about what to do, what gears to use in vehicles. Bulger says this extended training will help better prepare the younger soldiers for deployment. “Oh yeah, there are a lot of bugs, we’ve got a lot of young dudes, yeah a lot of young blood, but we also have a lot of seasoned leadership,” Bulger says. He says one way they overcome the inexperiences is to do a lot of different iterations, where soldiers do a lot of different tasks and leadership positions in the training exercises known as lanes. “We do at least three iterations of each lane so that people have a lot of different jobs and they get a good grasp of what it’s like to wear a lot of different hats,” Bulger says. Private first class Anthony Yeager of Waukee is one of the “Joes” or “young dudes” that Bulger talks about. Yeager is a heavy equipment operator who has been in the guard a couple of years. He arrived at Fort Riley after some initial training at Fort McCoy, Wisconsin. “It’s been pretty good training, we’ve been helping out the combat engineers, got to blow some stuff up, blow some C-4 back at McCoy,” Yeager says. Yeager and his fiancee have a son and plan to get married in July. Yeager was asked about his fiancee’s thoughts about him leaving to go overseas a few months after they’re married. “She knew I wanted to deploy. She’s not a big fan (of the deployment), but she supports me,” Yeager explained. Yeager says he is looking forward to deploying and is “maybe a little scared” because he doesn’t really know what to expect. Specialist Sky Pogue of Davenport is another one of the younger soldiers. Pogue is in his third year in the Iowa National Guard and is anxious to get the training out of the way. “Kind of looking forward to it, like sitting on the bench all year on the baseball team and finally getting in to go play. So it’s our turn to get in there,” Pogue says. The Iowa soldiers will wrap up their Minnesota training at the end of this month, they’ll then go to Mississippi in July for additional work, and then to California for their final training before deployment in the fall.